Learn or teach about film and filmmaking with this highly engaging, interactive guide for ages 9 and up. This 148-page multitouch book is made for iPad, Mac and iPhone, with 55 video clips, stills, interactive pictures, audio clips and pop-up tips and questions. It includes practical activities and links to downloads. The next part of the book introduces equipment and explains how to plan your movie (scripting, storyboarding and organising your shoot), with an illustrated introduction to how to film as a team. It also explains how to edit and share your movie, with short video clips showing key video editing techniques. Over twenty pages of filmmaking activities help to build planning, storytelling and filming skills and develop understanding of camera position, shot size, sequences and sound. There’s a download link where you can access two sets of video ‘rushes’ to practise editing, and a set of templates to help with film planning. 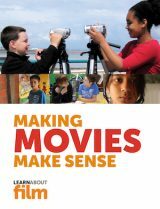 Making Movies Make Sense was developed by Tom Barrance, director of Learnaboutfilm and a film educator with over 30 years’ experience of working with children, young people and adults. Making Movies Make Sense is designed for ages 9 and above. It’s also a useful introduction for educators who are new to teaching film. You can get Making Movies Make Sense from Apple Books. It’s also available through Apple’s Volume Purchase Program for Education. You can download a sample from the Apple Books link below. If you’re an education influencer or you’re planning a large-scale purchase, request a free copy. The iPad app version of Making Movies Make Sense has been withdrawn as it isn’t compatible with recent Apple operating systems. 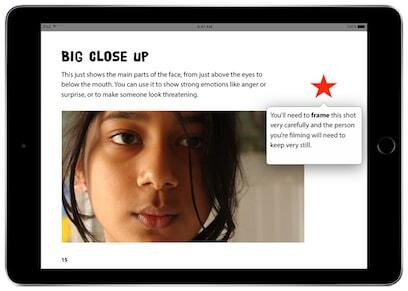 This new Apple Books version replaces it, and is substantially revised and expanded. If you don’t want to buy the new book, I’ve created a free basic version for owners of the iPad app. Contact me with proof of purchase and I’ll send you a download link.